Exporting floor cushions, chair pads in multiple shapes and sizes in woven cotton plain colors, prints, checks stripes, jacquard, dobby and damask floral, stripes and motif designs. We also make in christmas designs. We render zen cushions in a variety of colours and with a durable cotton cover. 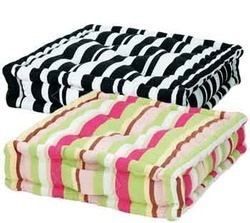 Theses cushions are very comfortable and easy to carry with a reinforced handle at the side.